Finding the right products to protect your boat can feel like a daunting challenge. Boat polish versus wax? Cleaner wax or restorer wax? When you walk into a marine store, there are rows of these products that all claim to do basically the same thing at different prices, so where do you turn? Even if you don’t take care of boat maintenance yourself, it’s still important to know what type of products the people you pay to take care of your boat should be using on her (unless you really trust that pimply 18 year old down at the marina to make that decision for you). Carnauba/Pure Wax: A soft wax with no compound (grit) in it; primarily made from a natural palm wax. Polishes: A synthetic mixture that performs similar to wax, but does not contain carnauba wax. Cleaner Wax: A mixture that has compound mixed in with wax. Restorer Wax: A thick mixture that contains a high amount of compound (grit). 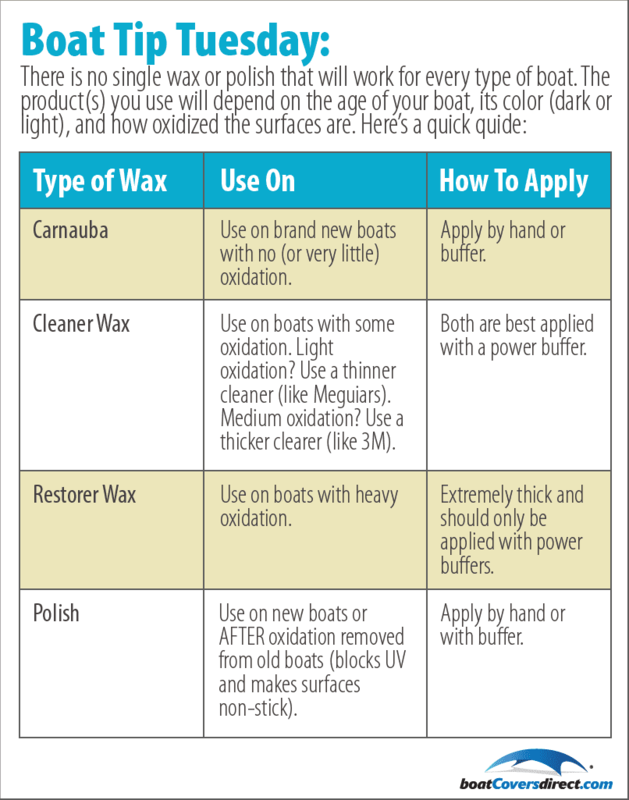 Be sure your boat is completely clean and dry before applying any polish or wax. A soft cloth or polishing pad will suffice as an application tool. It is important to make circular motions when applying the polish/wax to the hull. Continue rubbing into the hull until you see a glassy glare. If you’re a disbeliever of the positive results of waxing/polishing, see the results for yourself in the video below. Do you have proof of its miracle work? Send us a picture of your glossy finished boat and we’ll offer you a discount off your next purchase with BoatCoversDirect! Next: Share Your Boat Stories, Photos & Videos Here! Previous: Danielle Won a Custom Carver Boat Cover For Her 2012 Edgewater 240IS!